An image of the WWE United Kingdom Championship ดับเบิลยูดับเบิลยูอี ยูไนเต็ดคิงดอมแชมเปียนชิป. ↑ Currier, Joseph (December 15, 2016). "WWE to crown first United Kingdom Champion in January". Wrestling Observer Newsletter. สืบค้นเมื่อ December 15, 2016. ↑ Keller, Wade (December 15, 2016). "WWE announces new UK-based brand, holding tournament to crown UK Champion, Nigel McGuinness on announce team". Pro Wrestling Torch. สืบค้นเมื่อ December 15, 2016. ↑ Soucek, Andrew. "SOUCEK'S WWE UK CHAMPIONSHIP TOURNAMENT REPORT 1/14: Ongoing coverage of night one of UK Championship tournament". Pro Wrestling Torch. สืบค้นเมื่อ January 14, 2017. ↑ 4.0 4.1 4.2 4.3 Soucek, Andrew. 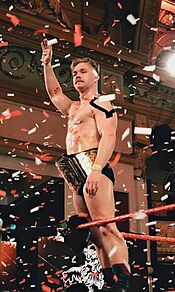 "SOUCEK'S WWE UK CHAMPIONSHIP TOURNAMENT REPORT 1/15: Ongoing coverage of night two of UK Championship tournament". Pro Wrestling Torch. สืบค้นเมื่อ January 15, 2017. ↑ Zimmerman, Zack. "5/20 Zim's NXT Takeover: Chicago live review – Bobby Roode vs. Hideo Itami for the NXT Title, Authors of Pain vs. Johnny Gargano and Tommaso Ciampa in a ladder match for the NXT Tag Titles, Asuka vs. Nikki Cross vs. Ruby Riot for the NXT Women's Title". Pro Wrestling Dot Net. สืบค้นเมื่อ May 20, 2017. หน้านี้แก้ไขล่าสุดเมื่อวันที่ 27 มกราคม 2562 เวลา 02:02 น.